At the Primorskij Boulevard's west end note the (pre-revolutionary) governor's palace, which incidentally was heavily damaged in 1854 when the British and French bombarded it. 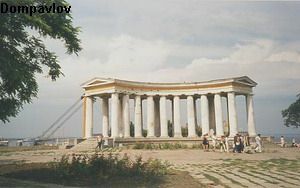 Count Vorontsov built a Grecian colonnade which overlooks the harbor and also provides a fine view of the bay. against France at this time, he was appointed commander of the Russian forces in Wellington's allied army 1815, governor-general of Novorossia (New Russia) and Bessarabia 1823, set up his court at Odessa, which he helped develop, built Alupka Palace, near Yalta, Crimea, Ukraine, 1828-46, also known as "Vorontsov Palace", governor-general (viceroy) of the Caucasus 1844, elevated to rank of Prince 1845 by Nicholas I, Tsar of Russia, incredibly, his nephew Sidney Herbert, 1st Baron Herbert of Lea was British Secretary of State for War 1845-6 and again 1852-5, during the Crimean War 1854-6, when Britain was allied with France against Russia, incredible to have two such important men on either side so closely related, died 6th Nov 1856, Odessa, age 74 yrs, buried in Odessa Cathedral.